Most of us look forward to welcoming the New Year. The time is filled with a lot of anticipation since we don’t know what kind of experiences and lessons the coming year holds for us. This is the time when everyone is in the mood to celebrate. It is quite common for people to go on vacations to usher in the New Year and have a good time with their loved ones. This allows them to truly let all the worries go and just have fun. Various vacation destinations are available to celebrate the event. If you are in the party mood and want to visit a place that has a lot to offer, Las Vegas is an option that would not disappoint. While planning a trip, the first thing that you need to figure out is the cost, so that you can make your arrangements accordingly. This also allows you to set aside a budget for the trip and manage your expenses in an effective manner. During the holiday period, tourism is at an all-time high and New Year is no different in this regard. Thus, prices tend to escalate during this time as business owners look to make the most of the available opportunity. However, various deals are also available to ensure that tourists will be able to have the best vacation within their set budget. Therefore, it is advisable to conduct thorough research to get the best prices. 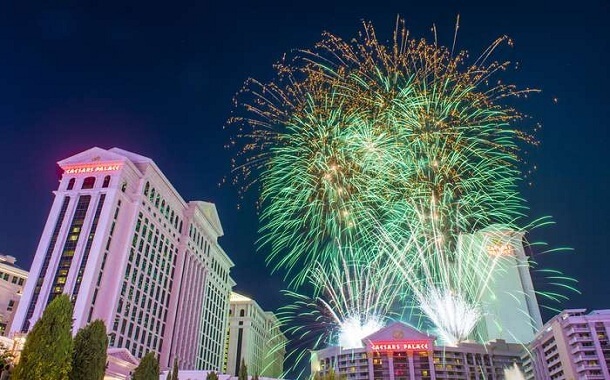 New Year’s Eve in Las Vegas is a crazy event where the casinos launch a firework display that you would remember for the rest of your life. This is an experience of a lifetime, a memory that would remain etched in your mind. Accommodation might be difficult to get during this time since people from all over the world head to Las Vegas to bid farewell to the current year and welcome the coming one in style. Therefore, you would need to make your booking well in advance to ensure you get a room at a decent price. The average cost for this would lie in the range of $1,000 to $5,000, depending on the type of room you get and the hotel you opt for. During the celebrations, you will find plenty of options to entertain yourself. Skyline celebration with open bars, music and a lot more is available at a cost of around $269. Chateau Nightclub is another place that offers you entertainment for $350. If you are looking for an affordable option that would not cost you a lot, Mystère by Cirque du Soleil is something that you can try since it would cost you around $70 per person. Traffic can be quite a challenge in Vegas during this time since there are more people in the place than in normal, off season periods. Thus, if there is any place you need to be at, you would have to head out well in advance. Various roads are also closed to traffic during the celebrations, so this is something else that you will have to keep in mind during your trip. If you take your own car, be prepared to use your GPS to get out of crowded or closed roads. As for food and other necessities, the cost depends on what you are looking for. If you want a luxurious menu at a fine restaurant, the price can hike up to as much as $2,500. On the other hand, if you would rather keep your budget restricted, you will come across options that would cost you less than $50. Hence, this is something that you would need to decide according to your budget. Should the average working Joe celebrate New Year in Las Vegas? New Year in Las Vegas is an experience that you should definitely have at least once in your life. No city parties like Las Vegas, and it wouldn’t take you long to get in the mood as well. The only thing that you would need to ensure is that you make your booking in advance since the rooms run out fast during New Year. Remember not to spend more than your wallet can handle and try to stay away from casinos if you’re not a professional gambler. How Much Does Home Decoration for Christmas Cost? How Much Does the Everlast Notebook Cost?